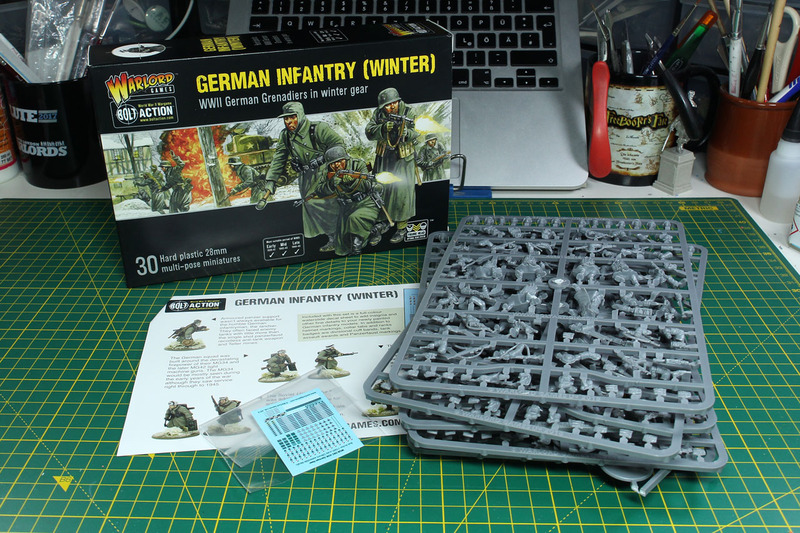 After starting the themed week with the supplement The Road to Berlin itself, and covering several tanks as well, it is time to review the matching infantry kit of the Germans in winter gear. 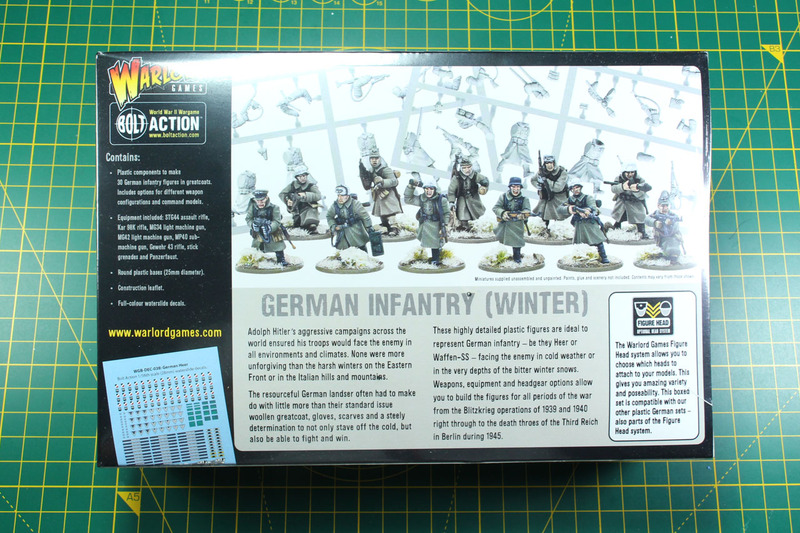 Last year, along with the The Battle of the Bulge, Warlord Games supplied the Germans with an extensive range of winter troops made from metal. 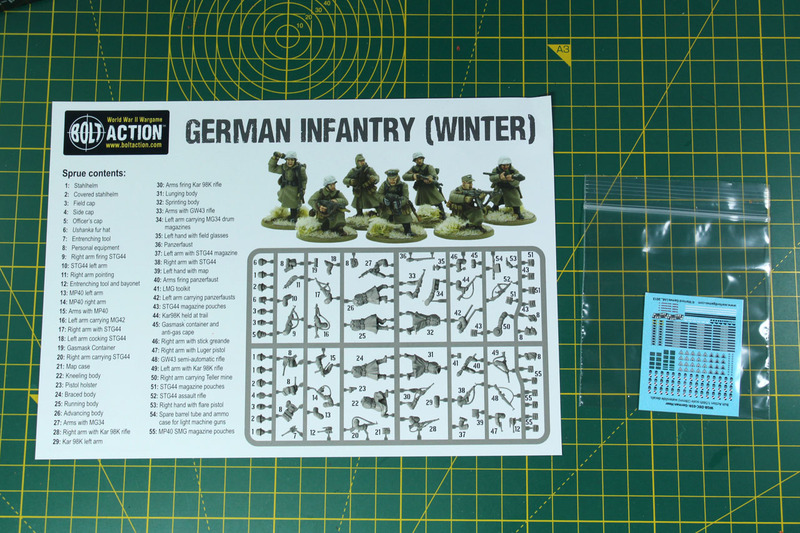 Around the end of April, for the Salute, a new plastic kit for the "Winter Germans" was introduced, to cover the fights on both, Western and Eastern front during the winter. 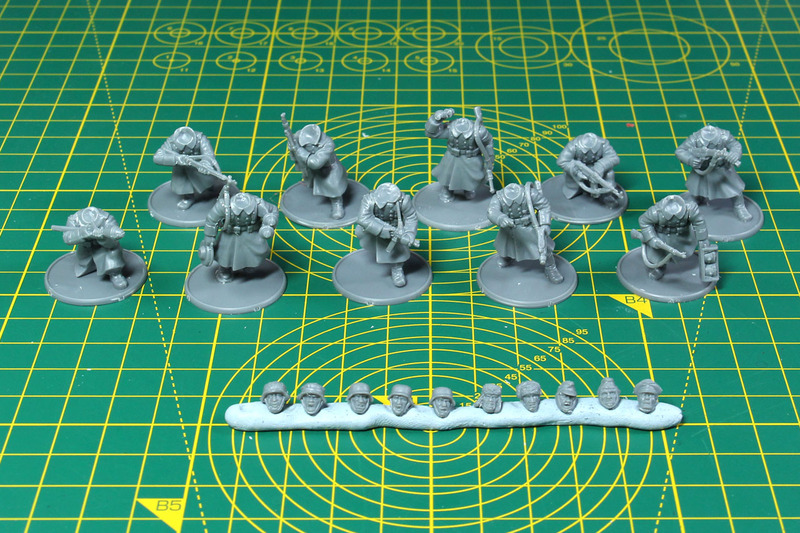 This box contains 30 miniatures in 28mm scale made from hard plastic. The price is set at 26 GBP. 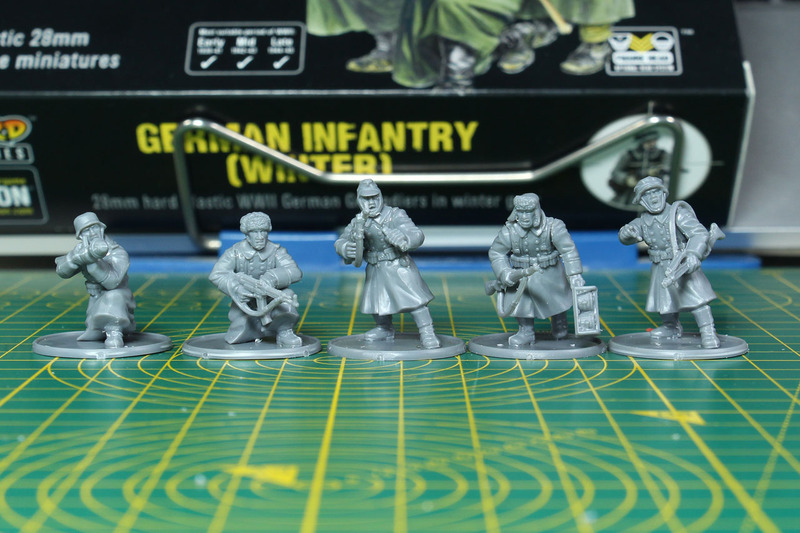 As you can see from the classification on the cover, these can be used for early, mid and late war settings. 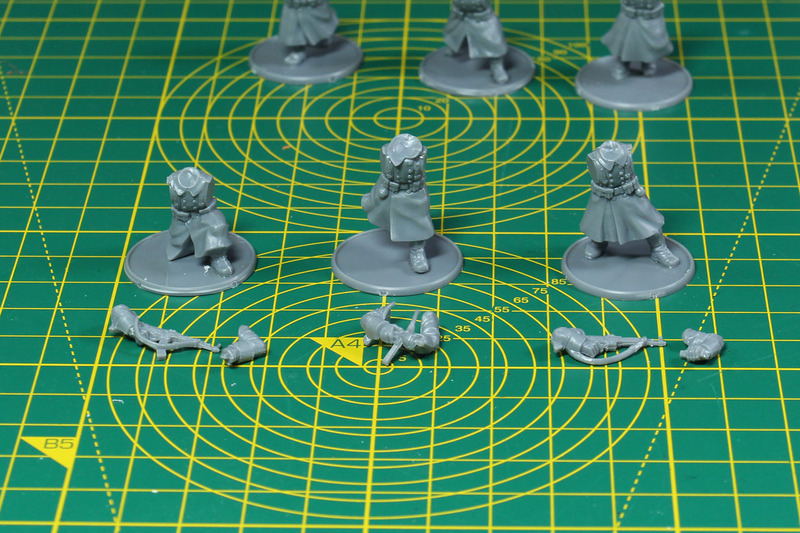 The kit contains 5 sprues of 6 soldiers each, along with 30 plastic round bases of 25mm diameter. 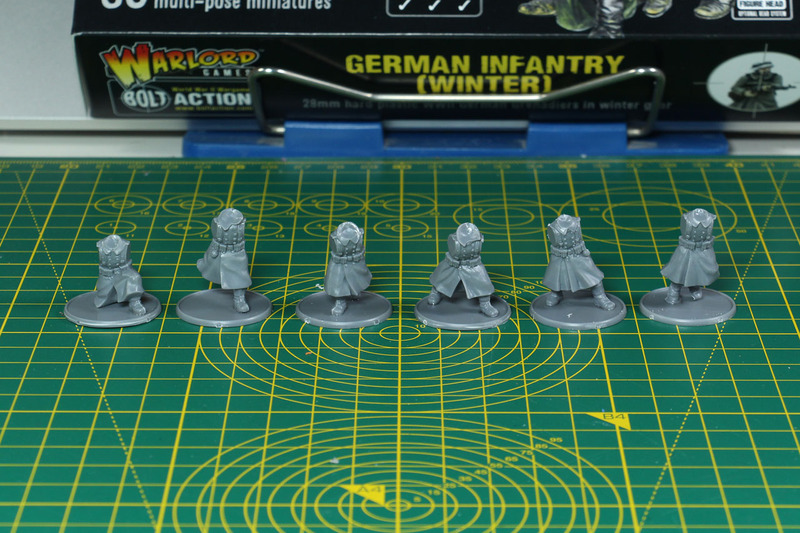 These are the new Warlord Games plastic bases and come with a small lip for better filling with base material. 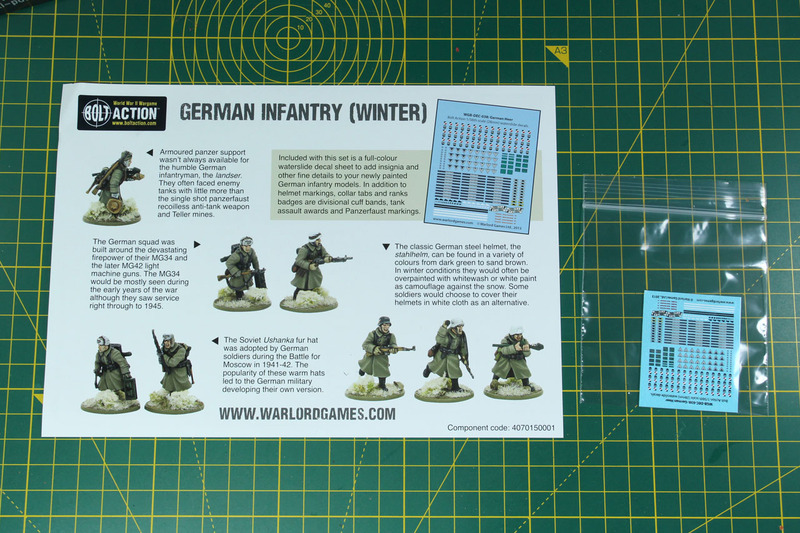 In addition to the sprues is a double sided info leaflet covering some background on the unit, assembly suggestions and a detail listing of the sprues content, along with a small decal sheet for the German infantry. 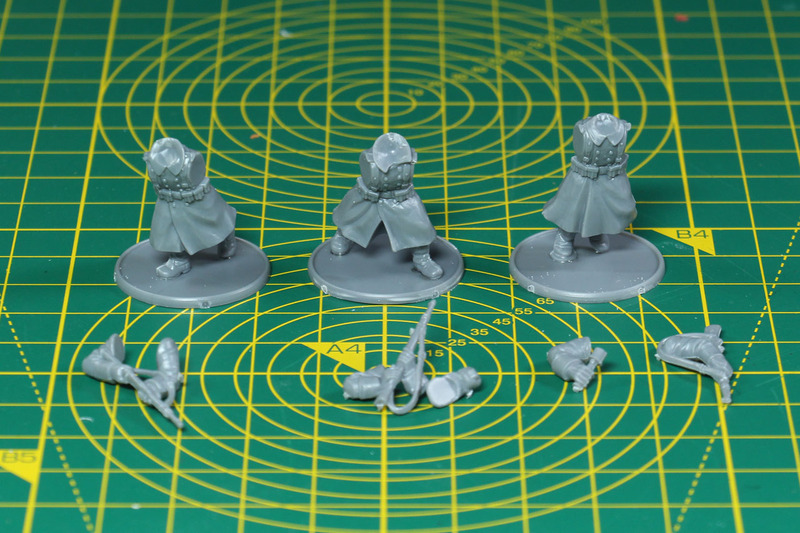 As mentioned above, a single sprue covers 6 different bodies in long coats, along with a broad assortment of gear and weaponry and an amazing variety of 14 different heads to choose from. The cast is crisp and with lot of detail, mould lines are there but minimal and easy to remove. 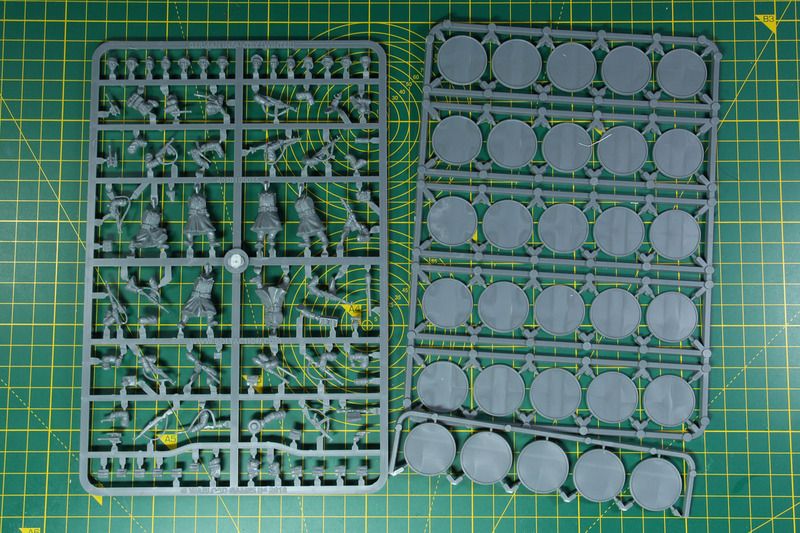 The sprue is tightly packed with parts and the weapons are sculpted along with the arms, so no more of the "fiddly" assembly of tiny weapons into tiny hands like in the very first kits. 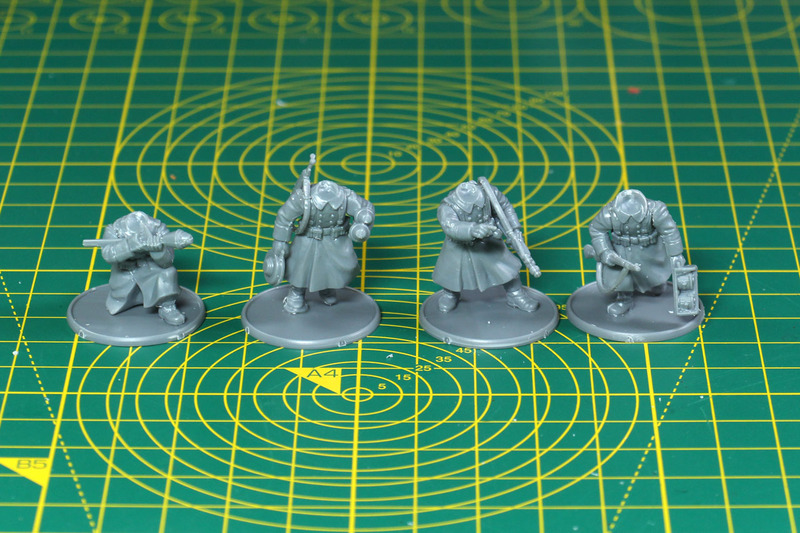 Let's start with the 6 different bodies, of which 5 are upright in walking / running poses and one is kneeling. 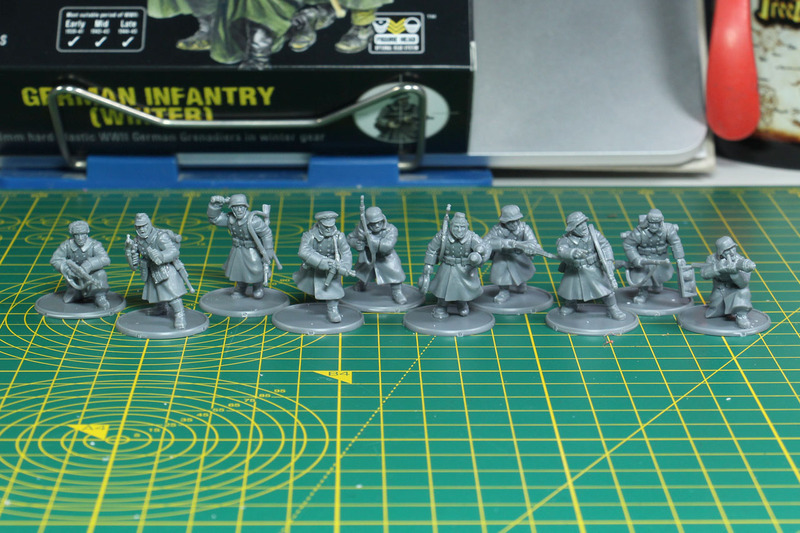 There are no lying poses in here, as some of the other infantry kits cover. As the weapon options are quite broad, I want to assemble these in smaller groups to go more into detail. 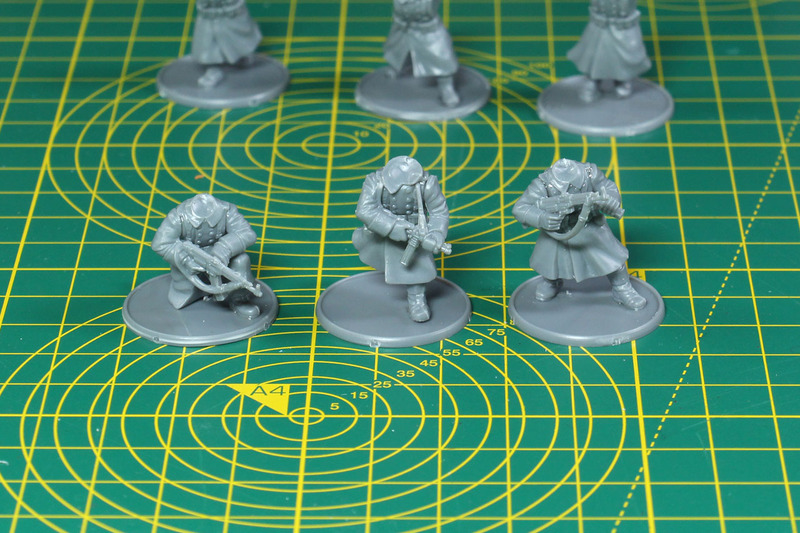 The sprue offers you for primary weapons regular Kar98 rifles, MP40s and STG44. For the Officer and two other soldiers I went with the STG44 und a MP40. The weapon arms have become more and more dynamic over the last boxes. 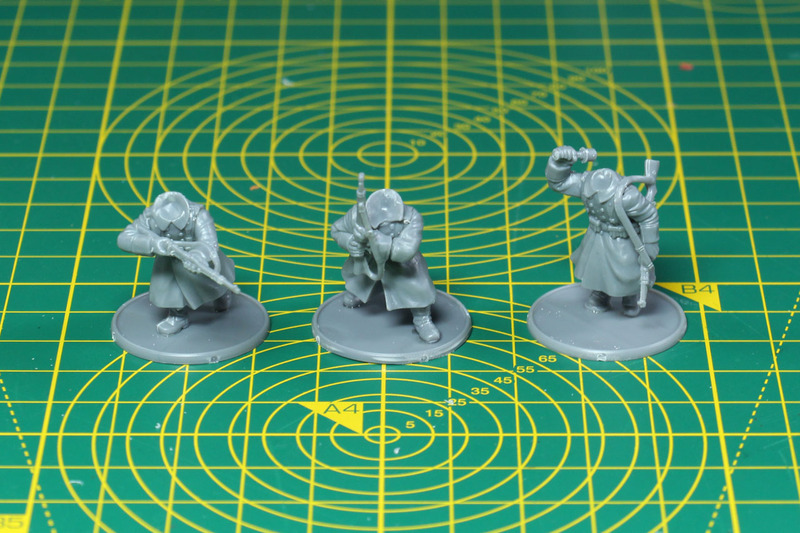 In this set you have a couple of reloading and casual carrying sets of arms. The next three Landser have the regular Kar 98K rifle, and again like mentioned above, carrying the same weapon but with very different poses. Alarmed, raised and casual over the shoulder to be able to throw a grenade. Of course there is special weaponry in this kit as well. You can give your winter soldiers Panzerfausts, either aiming or carrying under the left arm, and of course this box covers the MG team. 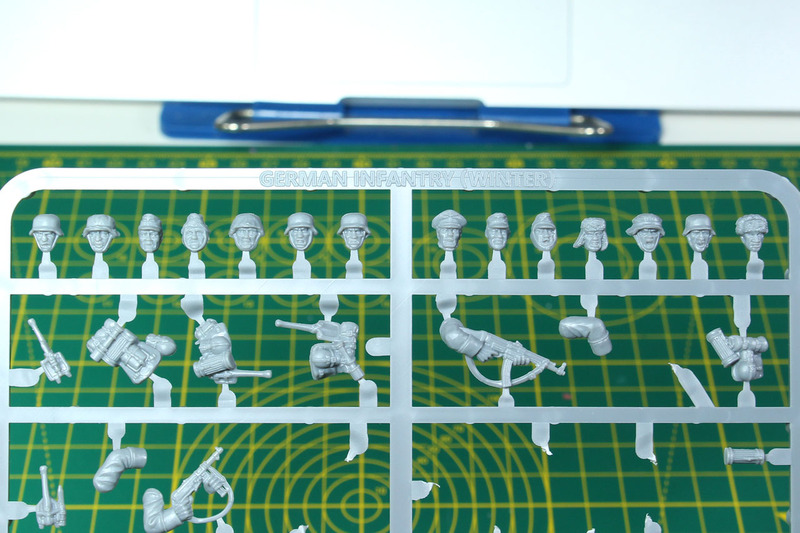 There is a MG34 and MG42 included in each sprue, depending if you're going for early or late war. There is only one left arm with the MG34 drum magazines. It seems like the dropped the open ammo-chain that was designed to be carried over the shoulders and the ammo case for the MG42 is only as a back pack item included. 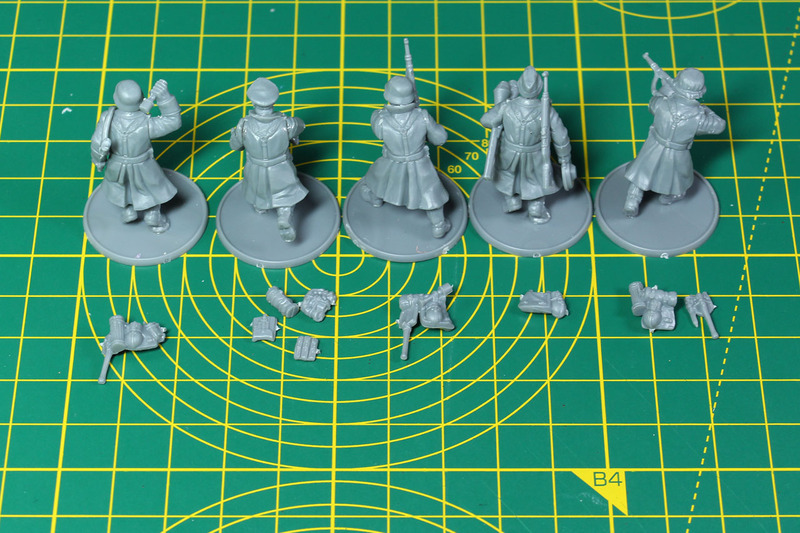 You can easily get that part from the regular Grenadier kit and convert it, if you like. More on that later this week. Next up the heads. We have 14 different heads to choose from, quite the broad choice. I really like that. There are regular Stahlhelm heads, covered Stahlhelm heads, field and side caps, the officer's cap and two fur hats. 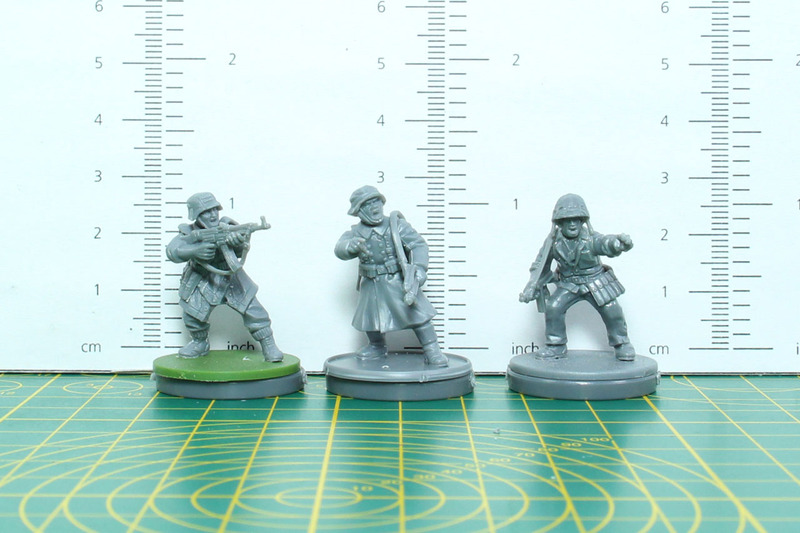 You can use the heads from the other German heer boxes as well, if you want to go more into the specific late or early war boxes. 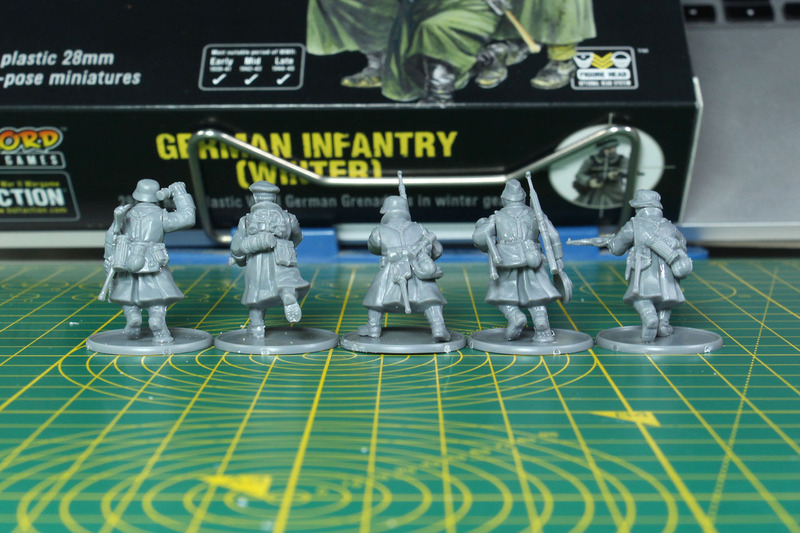 Especially the German grenadier set has similar helmets, but more with camouflage netting, that could be mixed in here. Now we have to add the back packs and pouches to the soldiers. 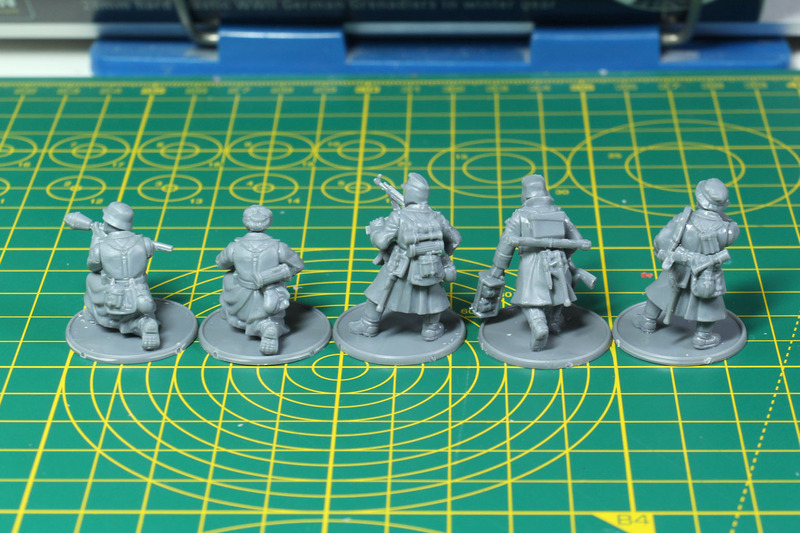 I went with a load out according to their weaponry, so giving the MG team the spare barrel and ammo case, a map cap for the officer and the regular gas mask container, entrenching tool and personal equipment for the remaining Landsers. And the whole squad together. 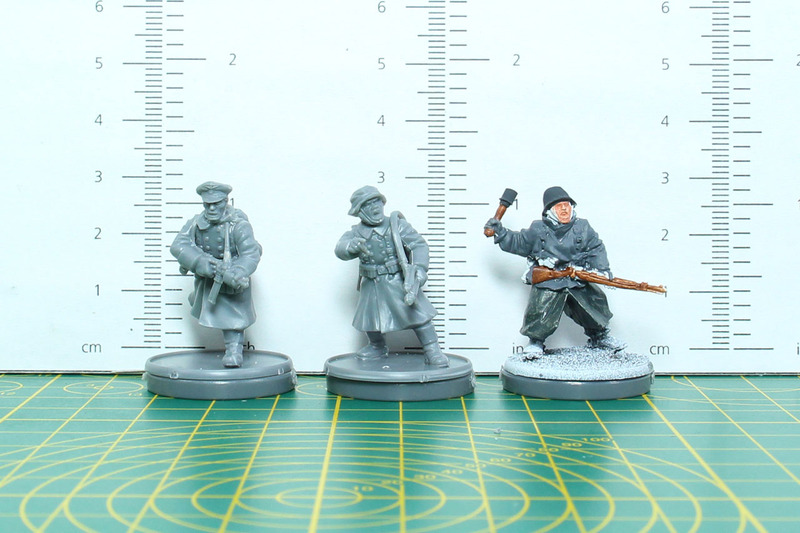 A brief comparison of the plastic Winter Germans next to one made from metal, and one with the German Grenadier and US Marine next to it. 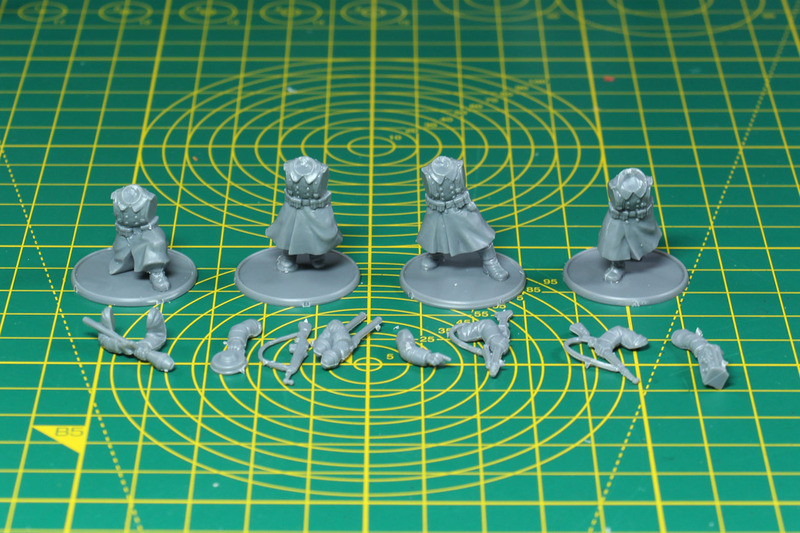 And a few close up of the miniatures set up in squads of five. 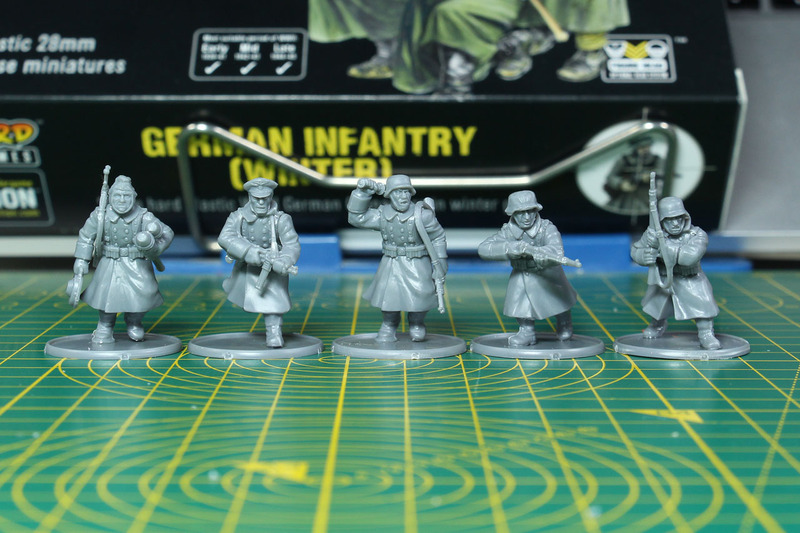 Depending on your load out, you could field a small 500 point army with this box, a first lieutenant with two Soldiers and 3 squads of 9 soldiers each (each of them with a MG and couple of options you feel like, Panzerfaust, MP40 and/or STG44). 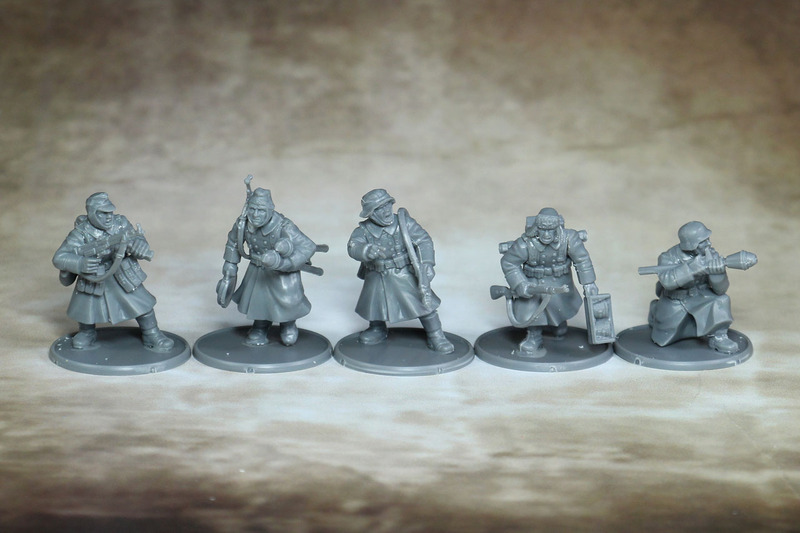 You can go lower or higher, depending if you want to use these long coat soldiers as fierce veterans or the poor Osttruppen. 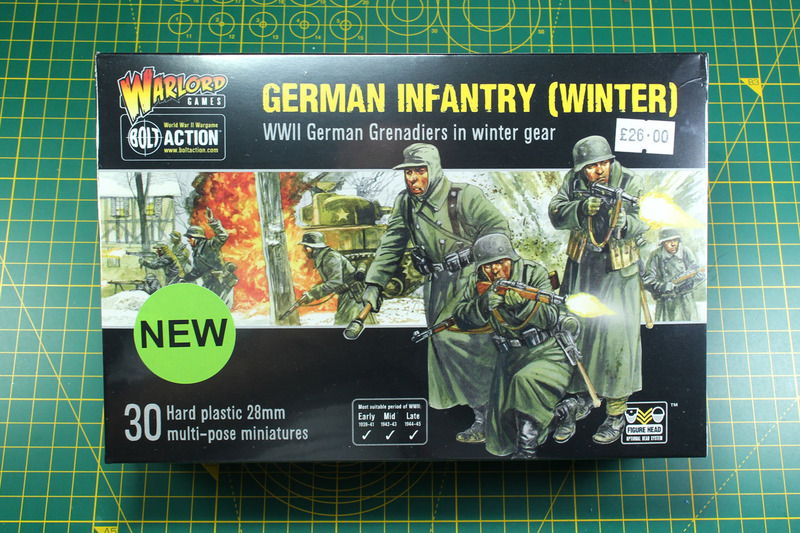 With this kit, Warlord Games really completes an as of now well done range of Winter Germans. 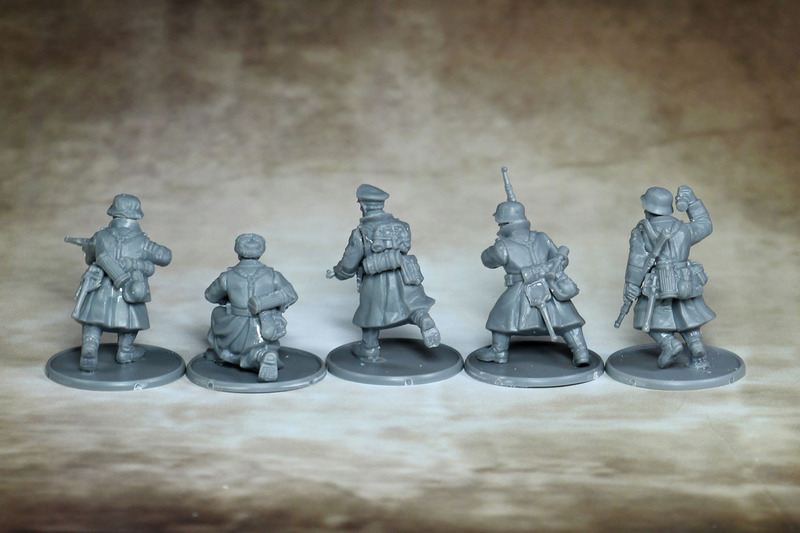 The individual blisters they already offer are very characterful, you have tank crew, HQ, several weapon teams, but "only" a single squad of 10 different soldiers. 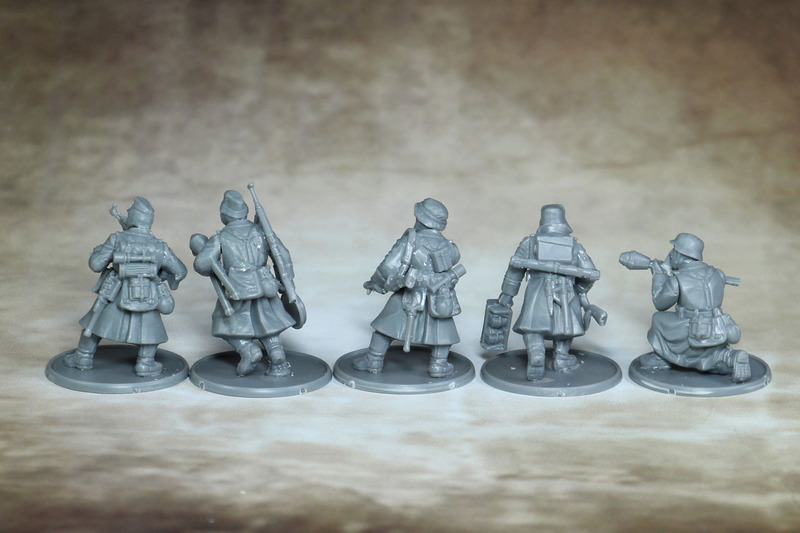 You can mix them up with Gebirgsjäger and some American GIs in winter gear as Brandenburgers, but with this plastic kit you can really bulk up your army. 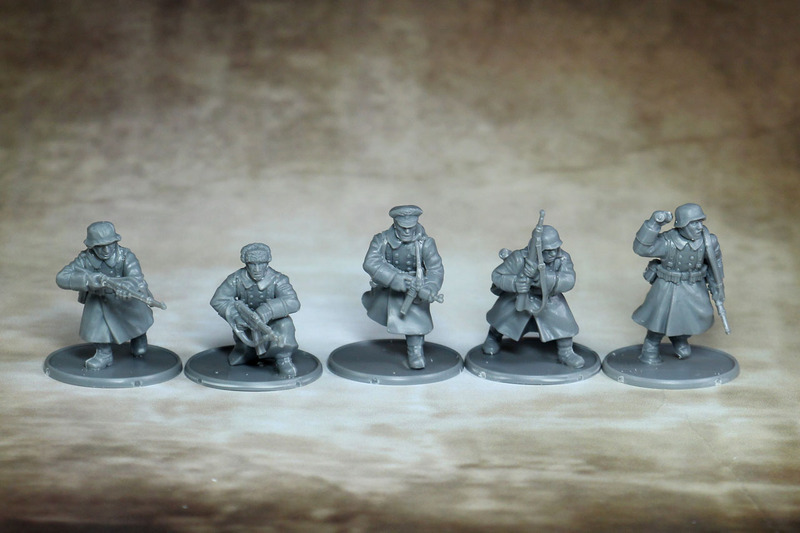 Keep in mind that these are compatible with other plastic sets, so if you get yourself another box of German Grenadiers or Winter Russians, you can extend the possibilities of this kit even further. I'll pick up that thought in an additional article and show you what I mean. I like the dynamic poses, the weapon arms are more lifelike and they faces have a good amount of expression. I am very pleased with the result of this box. 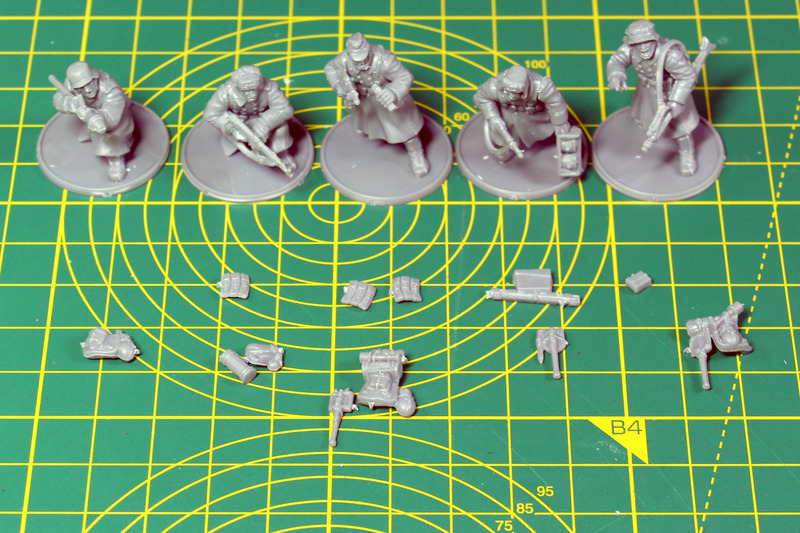 As Bolt Action is a compact and fast game, you can use this box as the starting point of a new project, add a medium sized vehicle and two blisters and you're good to go. What do you want more?